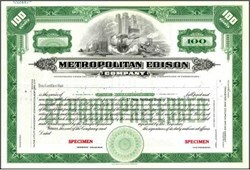 Beautifully engraved SPECIMEN certificate from the Metropolitan Edison Company. 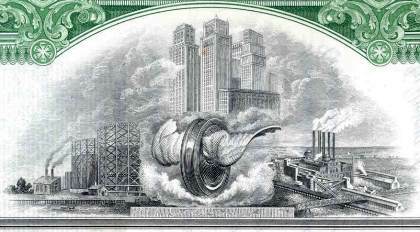 This historic document was printed by the Security Banknote Company in 1934 and has an ornate border around it with a vignette of a wheel with wings in front of a city skyline. GPU, Inc., a Pennsylvania corporation, is a holding company registered under the Public Utility Holding Company Act of 1935. Its three domestic electric utility subsidiaries Jersey Central Power and Light (JCP&L), Metropolitan Edison Company (Met-Ed) and Pennsylvania Electric Company (Penelec) are conducting business under the name GPU Energy. GPU Energy, annually provide approximately 44 billion kilowatt-hours of electricity to more than 2 million customers in New Jersey and Pennsylvania.